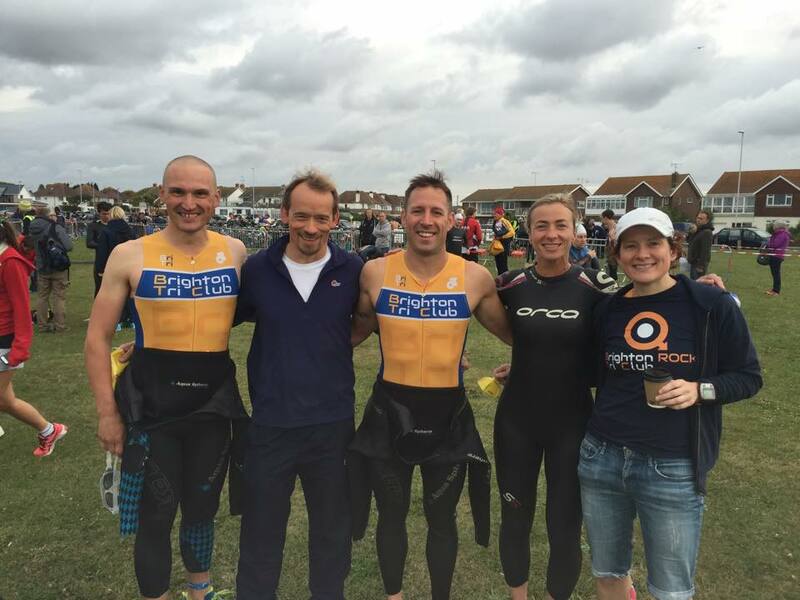 Triathletes travelled from all over the UK this morning to compete in Worthing Triathlon, a GB age-group qualifier race for the 2016 Lisbon ETU Standard Distance Championships. Promised a summer, seaside triathlon athletes were put to the test with the autumnal conditions; a choppy 1500m sea swim, windy 40k bike and a wet 10k run! Luckily for the sprint athletes, they missed most of the rain but still had to take on the rough sea! (Sprint: 750m, 20k, 5k). With a really early start, the Sprint athletes were in the water for 6.30am. An extremely popular race, Worthing was sold out for it's 12th year. The blue and gold peppered the seafront throughout the morning, including 5 of our men competing in the Sprint. Congratulations to Ian H, Jon B, Rich T-C, Ryan J and Steve B who finished in some fantastic times despite the choppy sea! All results can be found here. The Standard race this morning was an opportunity to compete on a national stage without leaving our county. An incredible 24 Bri Tri athletes were on the start line, faced with a competitive field. Congratulations to everyone who raced, including Simon T, Matt B, George H, Tom G, Keith R, Paul Mac, Ben M, Marianne C, Mike P, Kevin H, Tom A, Graham S, Richard Y, Elle B, Mark L, Jason C, Clare M, Cathy K, Claire T, David B, Simon L, Leanne G, Jane M and Simon W, Rachel P and Gill as a relay. In terms of GB qualification, there are 20 places available per age-group. Automatic qualification will be awarded to the first 4 eligible athletes in each age group at each qualification race giving a total of 12 automatic qualification places. Simon Taylor (50-54), who won a cross triathlon bronze medal for GB in Germany last week has sealed himself another trip in his GB tri-suit. Simon finished 3rd (2:15:04) in his age group automatically qualifying for the 2016 Lisbon ETU Standard Distance Championships. Marianne Clarke (50-54), who won Windsor Sprint earlier this season and already a GB age-grouper, will also automatically qualify with a 2nd place finish in her age group (2:29:42). George Higgs (45-49), placed 2nd in his age group with an impressive time of (2:17:25). George will automatically qualify for Lisbon. Keith Rochfort (30-34), Brighton Tri Novice, finished 4th place in his age group (2:18:30) with an incredible 36:06 10k run. Unfortunately, as Keith will be (35-39) in 2016 he will not automatically qualify. We also had a relay team in the Standard. Simon, Rachel and Gill finished in 2:28:46, 3rd place for the relay. Despite the torrential rain and strong winds, there was still an incredible energy at Worthing Tri. Thank you to Raw Energy Pursuits for hosting another great event and to all the volunteers and marshals who look after us out on the course. A special thank you to the medical team on site for looking after our own Leanne Garner, GB age-grouper, who was in strong contention for an automatic qualification for Lisbon but unfortunately came off on the bike leg. We now look forward to Ringmer Triathlon on the 23rd August, following our Kids Triathlon (22nd). In the mean time, don't forget there is also Go Tri!